Includes HP's widely popular RPN data entry mode. The calculator that more professionals rely on. 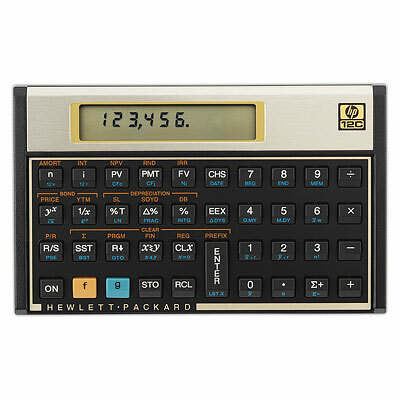 What makes the HP 12C the industry standard in financial calculators? Power. It has 120 built-in functions to ensure that they are available when you need them. And with millions of users all over the world, you know it’s reliable. The HP12C. The smart choice because it’s the industry’s choice. Refurbished units when listed have been individually tested by one of our experienced staff and come with a 90 day warranty through us. They include the calculator, batteries and user's manual on CD. HP 12C Financial Programmable Calculator - Solutions Handbook.